There are many reasons why it might be time to breathe some new life into your old and faithful Brain but one of the most common that I’ve bumped into is too many Thoughts linked under one parent or general category. Now how does this happen? Isn’t that the point of TheBrain? Let me explain. There is a wonderful freedom and ease of use that we all experience when first creating our Brain or adding a section. Weee!! Just drag and drop and in that file goes! Yippy, drag from my active Thought and add one more idea, now captured and forever incarnated in my digital Brain. It’s just plain fun. This process of adding information in and creating new Thoughts and linking them together is absolutely critical for building and taking advantage of your digital Brain. However, you might have a few areas where you have too many Thoughts grouped together. You can tidy this up quite nicely with some additional subcategories for these Thoughts. Now this is where you get to sing the Sesame Street Song! The task here is to look for commonalities and natural sub-groupings of Thoughts. For instance, if you are a consultant and have hundreds of clients rather then listing all one hundred clients under your “Client” Thought you might want to divide these clients up by industry, service, or territory… Or maybe all three. Remember that your Brain isn’t a linear file system so putting something under multiple categories is no problem. This can get messy. So look for similarities between large groups of Thoughts to further organize. Creating some intervening Thoughts that help classify and organize other thoughts can help you understand your subject matter further. I have also seen large amounts of “top level” Thoughts in users’ “Personal” sections. I think this is because your Personal area can become a nice and convenient holding ground for everything that isn’t part of your business projects. (And BTW, that’s a good thing because this means that you’re capturing cool web sites and amazing ideas instead of forgetting about them or losing them on the Web or your hard drive somewhere). So here again if you have too many Thoughts under your “Personal” section you need to create some subcategories to move these Thoughts under. Look for ways to group or “infochunk” these items. Some suggestions might be distinguishing information that is a hobby, family, house issue, personal finance, beauty or health. These additional categories also help you learn about yourself and create “knowledge hubs” for key interests and projects in your life. A good way to identify these knowledge hubs is to look at your Pins. Identifying key knowledge hubs in your Brain will serve to orient you to various sections. Once you have identified your key knowledge hubs you might consider connecting them all right under your home Thought, which a lot of the time is the name of your Brain. For instance under Shelley (my home Thought), I have Business and Personal as key paths in my Brain. My key knowledge hubs under Business are Product Development, Marketing, Sales, and so forth… Once you have identified your key knowledge hubs make sure you have pins for your main ones and now you can begin review the structure under each hub and the Thoughts that are connected there. This is the B side of Tip #1. This may not apply to everyone, but some people can definitely use this…There is a type of Brain user that simply can’t move beyond hierarchies. You have a Brain of subcategory to subcategory, child after child, and sometimes the document that you use all the time is buried very deep in a very stratified Thought structure. Now of course you can get to any Thought in a matter of a second with “instant activate”, one of TheBrain’s most powerful features. Regardless, the structure of your Brain should serve your Thought process and drive discovery in a way that information hierarchies can’t. This is the classic issue of breath versus depth. One of the reasons TheBrain is so different from conventional mind mapping software is because of its ability to move beyond sub branching of information. In other words, something at the bottom of one category/Thought structure can easily be a parent or link to an idea somewhere else. You can have your cake and eat it too! Don’t forget this! So, if you have a document that is organized as a great, great, great grandchild within a Thought structure, remember it can always be connected at a higher level somewhere else. For example, I have wonderfully deep thought structure for my client proposals, however the one that I’m focusing on currently I link right under my “Sales” Thought. This way it is ever present and easy to get to when I’m in the sales area. Now, when I’m done working on this proposal Jerry’s concept of “Gardening” comes into play and I unlink that proposal from sales so it resides where it resides. Isn’t life in your Brain grand? Once you start creating the right number of Thought categories you’ll find it very easy to move beyond a single hierarchy because it’s very rare that an idea or document will only fit exclusively under one concept. Connecting people to projects, their peers or expertise is another example or idea which can help you evolve your Brain beyond basic hierarchies. For instance, you might have a people map of your corporate directory in your Brain. People reporting to other people displayed as parent-child links. (This is very useful when working with large teams.) But each person might be an expert in a different research field or run a certain department. While still having that person nested within its reporting structure you can make a lateral (or in Brain lingo, “jump”) connection to their expertise. So your hierarchy of services or departments interlocks with your hierarchy of people. This can be very powerful for illuminating on complex data sets. When viewing sales information I have a lateral connection to a key executive in charge of that division. Clicking on that person displays their relevant position in the corporate hierarchy. This is one example of an interlocking hierarchy between people and departments. One of the neatest little improvements TheBrain engineering team made to TheBrain’s instant search is the ability to identify Thoughts with the same name by showing what else they were connected to…However this does beg the question, what are you doing with redundant Thought names? But hold on… Don’t just create another name for the sake of making it different – try something that is more specific. For instance I’m working on a newsletter for March, so I start to create a Thought called “March Newsletter” and lo and behold what does TheBrain show? A Thought that already exists called “March Newsletter”. This helps me realize that I should actually call this Thought March 2008 Newsletter and that I should start organizing certain projects by year and quarter in addition to project type. As your Brain ages, organizing by year can be very helpful for historical reference. And again because we aren’t working with your typical mind mapping software, just because you are organizing by year doesn’t mean that this has to be the only way. With TheBrain you can have one piece of information effectively located under multiple Thoughts. Finally if you do need to use the same Thought name more than once, you can use context-sensitive names. TheBrain offers a timesaver (affectionately known as the “comma trick”) for helping you manage Thoughts that should appear to have the same name, and are children of separate Thoughts. Here’s an example of when this might occur: Say you have Thoughts for each of your clients, each of which has a billing department. You’d like a child Thought named “Billing Info” for each of your client Thoughts. However, you may not want to have duplicate Thought names. Why? Because later, when you’re looking at these Thoughts you won’t be able to tell them apart without looking at their parents. Here’s how to remedy this potential dilemma when you create the new Thought: When you type the Thought name, first type the name of its parent, then type a comma, then type the name of the new Thought. The Thought will display its full name when it is active. When its parent Thought is active, you’ll see only the portion of the name that does not repeat the parent’s name. Ensuring that each of your Thoughts has a unique name will help find and identify them more easily. The part of the Thought’s name that is hidden is context sensitive. Say for example that you wanted to have a single place to see the billing information for all your clients. 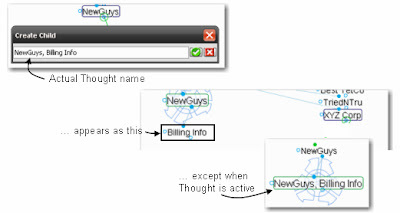 You might create a thought called “Billing Info” and then link to the billing information Thoughts for each of your clients, such as “NewGuys, Billing Info.” If you do this, when Billing Info is active then NewGuys, Billing Info will appear as just NewGuys, whereas when NewGuys is active, that same Thought will appear as Billing Info. Try it―you’ll see how this can be very useful. Customizing your Thought colors and background can result in some major improvements to your Brain. TheBrain has a number of cool customization options that can really make your Brain look spectacular! With version 4 there are zoomable icons that can really add some wow factor to your Thoughts. You can drag and drop pictures into your Brain to get the thumbnails or copy an image from the web and then right click on your Thought and select Paste Thought Icon. This sets the image as the icon for your Thought. All link colors, Thought text and backgrounds can be customized through the Preferences dialog. Also, remember there are some preset themes built-in in the Options Menu that will enable you quickly try out color settings and themes so you can test which ones are most complimentary to your work habits and content. I’ve been talking about subcategorizing large information groups as a means of further organization. But there’s also another way to do this, especially if you don’t like seeing a lot of child Thoughts under others, and that is to distinguish large volumes of information with Thought Types. Thought Types represent an additional level of classification on your Thoughts. You can give Thought types their own color, mouse-over labels and icons. If you have a number of child Thoughts, TheBrain will automatically group all your Thought Types together so you can easily identify key types of information. You can also set Link Types and adjust the thickness of your links to convey the strength of certain relationships. The possibilities are endless. With a little gardening and or analytics of a Sesame Street Song your Brain can be completely transformed. A little linking and unlinking can go a long way. To learn more on the how-tos of moving Thoughts around and modifying your Brain structure watch my TheBrain 202 class on editing your Brain. Thanks for the “reminders” – great stuff. I’ve been using the brain since 2000, and I still have to remember how flexible it is. In particular, jumps and pins are especially helpful when focused on a particular project. I keep second- and third-level thoughts visible and available by creating jumps and pins for them. That way, more concept associations are available and suggested to me immediately (as I’m working on the project). When I’m finished with that project, I just unlink them and remove the pins. I don’t have to navigate the labyrinthine structure of windows file folders. ThanksDavid. Version 4.2 has a new feature that lets you create context sensistive names for brains automatically. This makes using the comma trick even easier. When you create a new Thought, just name it starting with or ending with a comma. The name of the source thought will be automatically inserted.